Costa Rican Border Police have seized over $100,000 in cash in the southern region of the country since opening a new Inter-American Highway checkpoint in June. 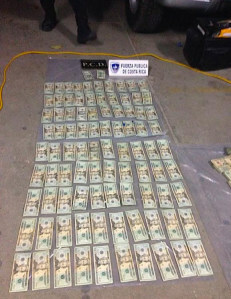 In the early hours of Friday morning, police confiscated a cool $38,946 from a Costa Rican man driving to Panama. The cash, all in U.S. dollars, was hidden in secret compartments inside a Toyota Tercel. Public Security Minister Celso Gamboa said the driver was arrested on suspicion of money laundering. Prior to Friday’s seizure, police have seized at least $79,000 in cash at the southern Kilometer 35 checkpoint, according to previous statements from the Public Security Ministry (MSP). MSP did not specify where along the highway the arrest took place. Authorities have confiscated contraband Costa Rican National Men’s Team jerseys, hundreds of cases of liquor, flatscreen televisions and fireworks at the Kilometer 35 checkpoint. On June 30, police arrested a Nicaraguan suspect for smuggling two Ghanaian migrants into Costa Rica from Panama.